According to Japan’s Health Ministry, the average life expectancy on Okinawa is 81.2 years – 86 for women, 75 for men – the highest in the world. Okinawa’s average is significantly higher than that for all of Japan – 79.9 – which tops all countries in life expectancy. Hong Kong, at 79.1 years, is second. Okinawa (the main island of a tropical chain of 160-coral islets) is the southernmost prefecture of Japan. It consists of hundreds of the Ryukyu Islands in a chain over 620-miles long. The islands extend southwest from Kyushu (the southwestern-most of Japan’s main four islands) to Taiwan. The Okinawa Prefecture encompasses the southern two thirds of that chain. The islands became Okinawa Prefecture of Japan in 1879; after the end of World War II (1945,) Okinawa was under United States administration for 27 years, when (in 1972) the US government returned the islands to Japanese administration. OK, so what about Hawaiʻi? While Okinawa over the centuries benefitted from trade with its neighbors, and was described as a “connecting point” between China and Japan, the loss of independence saw growing hostility between Okinawans and Japanese immediately after its annexation to Japan. Likewise, the islands of Ryukyu possessed only limited natural resources. Typhoons continuously destroyed crops. With increasing population, people faced the problem of inadequate food. Out-migration was seen as a solution. At about this same time, news was spreading about the 1885 agreement between the government of Japan and Hawaiʻi to export Japanese laborers to work on Hawaiʻi’s sugar plantations on the basis of a three-year contract. A large wave of Japanese laborers started arriving in 1885. Japanese also emigrated to Brazil and Argentina. The economic depression in Japan (and into Okinawa Prefecture) made the prospects in Hawaiʻi more attractive; adding to the burden, it was the custom for the eldest son to inherit the farm, leaving the other siblings to fend for themselves; and others sought to avoid the military draft. The similarity of climate of Okinawa and Hawaiʻi was an added attraction and enhanced the decision to make the move; Okinawa’s subtropical has an average summer temperatures in the mid-80s. Much of the year can also be rainy and humid. Because of this climate, Okinawa produces sugarcane, pineapple, papaya and features popular botanical gardens; along the shore, Okinawa has abundant coral reefs. Hawaiʻi looked like home. While Japanese from the four main islands were emigrating to Hawaiʻi, it took some time for folks on Okinawa to participate. 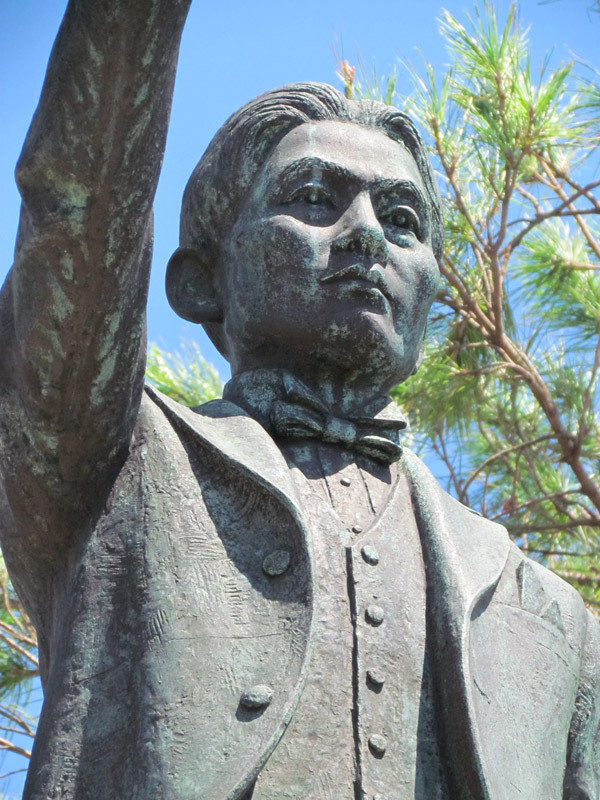 Finally, under the leadership of Kyuzo Toyama (referred to as the Father of Okinawan Emigration,) on December 5, 1899, 26-Okinawans set out to sail from Naha Port and arrived in Hawaiʻi about a month later on January 8, 1900. But, life in Hawaiʻi wasn’t easy. Adding to their problem was the Okinawan tradition of tattooing. Although outlawed with annexation with Japan, many Okinawan women had traditional tattooing of their hands and arms. Tradition suggests this started in the middle of the last millennium; Okinawan women tattooed the top of their hands fingers with purple ink to repel the samurai, who considered the markings distasteful. Tattooing then grew into a sign of adulthood and was part of rites of passage at key moments in an Okinawan girl’s life, when she gets married, has children, becomes a widow, etc. In Hawaiʻi, the Japanese from other prefectures considered tattoos to be a sign of low class or of a criminal element (yakuza.) This made many of the women ashamed and so they often hid their hands. Plantation work was hard – 10-hour days, 6 days a week under the brutal sun. Okinawans also endured double discrimination from both the local population and their fellow Japanese workers who treated them as second-class citizens. At the peak, some 1,700 Okinawan immigrants had settled in Hawai‘i. Many of the Okinawan Issei (first-generation arrivals) had planned to come to Hawaiʻi, work for a few years, and then go back to Okinawa with their riches. They sent money home, which helped the Okinawan economy. However, conditions in Okinawa deteriorated, with a post war depression following the Russo-Japanese War and World War I and people were starving. Compared to immigrants from other parts of Japan, more Okinawans brought wives or sent for their wives and children; this made it easier for them to adapt to Hawaiʻi, so many of them ended up staying. About half of the Okinawan immigrants either returned to Okinawa or moved to the continental US in search of better opportunities. The 31st Okinawan Festival is being held this weekend – August 31 and September 1, 2013 – in Kapiʻolani Park. The image shows Kyuzo Toyama; in addition, I have added other images in a folder of like name in the Photos section on my Facebook and Google+ pages.